I don't need no excuse to cosplay Ariel. This rad sketch-style skater dress is by Noodles at Geeks n Nerds Fair and comes in various themes including Disney Princesses, Hogwarts uniforms, and Star Wars, and they are all amazing quirky love. The hair I got in Olive's amazing 75% off Black Friday sale (sadly now over) is PERFECT with it, and I'm wearing Fri.day's wellies from Kawaii Project because I don't want to get my feet wet. Though that's Splash! lore, I guess. 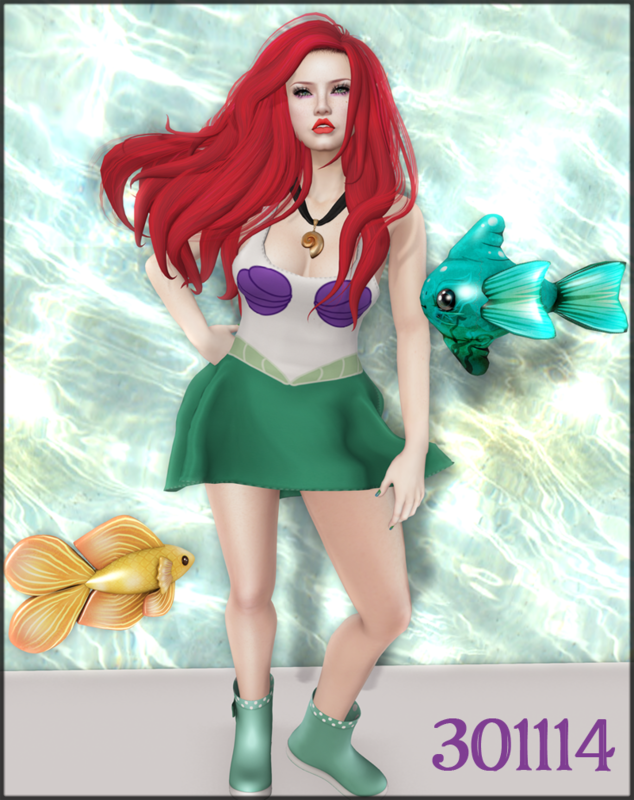 The necklace which is a dead ringer for Ursula/Vanessa's in The Little Mermaid was actually a freebie from Erare, the mermaidy side project at Celoe. It might still be there even. About my lip colour - it's from Nova Bodyshop, which is still relatively um....nova - and honestly their lipsticks are some of the best value on the grid if you own one or more mesh mouths. You get like 10 or more system layer lip colours within a colour family, plus appliers for Loud Mouth AND Nyam Nyam, all for usually about L$100, and as you can see, they're wonderful quality. My fishy companions are both from silentsparrow but separately. The one on the right is from the Elemen-Tails gacha machine, the other is a plushie available in the normal buying sort of way. They are each lovely though.